Security Machins - PART missing security print layer! In September 2009 we reported on the appearance on internet auction site eBay of the security version of the 1st class gold Machin stamps with no security 'overprint'. 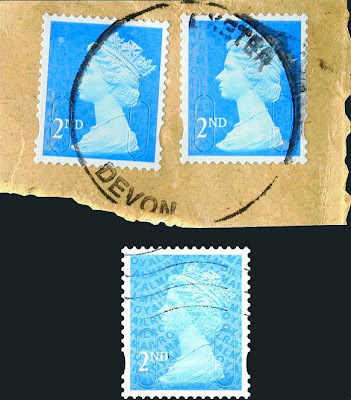 The pair, postmarked Devon & Exeter, were found in kiloware and aroused suspicions from expert collectors and dealers, but none could find a way to remove a properly printed security overprint without damaging the stamp. No copies were found mint, but before long further copies were found not only with no security print but with 4 security slits! These were postmarked Plymouth Devon. The 2nd class with four slits was reported in December. All these came from kiloware, but there have been reports of the 2nd class being found mint - we've not had photos of these supplied yet. Now a new development from California, reported in influential American weekly philatelic magazine Linn's Stamp News. Reader Michael Ward of California received a Christmas card from a friend - in Exeter - bearing 2 x 2nd class security Machins partially missing the security print layer. The stamp on the left has the security layer only at the extreme lower left of the stamp; the other stamp has only a stripe at the left of the stamp - giving all the appearance of being where the phosphor band would be on a 1st class stamp. Collectors here who saw the report questioned the use of inland 2nd class definitive stamps - 2 x 30p is insufficient for even a 10gr card, so there must have been more stamps. Maybe there were three which make 90p, exactly the 20gr rate? Maybe the card was contained in a packet (the stamps seem to be on heavy manilla rather than ordinary envelope stock) with a selection of other stamps. The stamps reported earlier were found on kiloware consigned to Singapore. It's interesting that with all the Machin collectors sorting through competition entry envelopes and kiloware that none of these have yet been reported as found in the UK. Watch this space for more reports, and if you find any, wherever you are, our readers will be interested! Interesting reading Ian. I can not wait for the mint stamps to appear, then we may get the whole story. I know that there are both 1st and 2nd class machins with shifts in the security print. In ist class case the shift is between 1-2mm from the top, with the second class version being about 1mm. Not quite as dramatic as your examples though! Ian, these illustrated examples aren't shifts in the security print, they are only partial prints - but we don't know how they happened. If there was a shift of this magnitude then part of the security print for the adjacent stamp would show. The 1mm shifts are only like normal mis-registration of colours and/or phosphor: this is normal and recent Christmas stamps showed very dramatic mis-registrations.